I finally bit the bullet and invested the time to brew an all grain beer. What does all grain mean? The link below will provide a good description but the short answer is best explained by tracking my brewing progression. I, or I should say we, John, Pat and I pooled our brewing equipment and formed our Laverton Avenue Brewing group. Laverton Avenue was our neighborhood street in the early 90’s in Bakersfield, CA. We started off using kits. We bought the extract, a thick syrup of malted grains, yeast, bottling sugar and hops. Kits can make great beers and we made some good ones and some that were OK. I then began brewing solo as I migrated to Texas. I expanded into doing partial mash, that is, using specialty grains add complexity, new flavors, color and more body to the beers. I also began to “keg” as well as bottle my beers. I use Tap-a-Draft 6 Liter mini kegs. I have made some really good beers this way. Today was step 3…..all grain, no sticky extract syrups, just all grain that needed conversion through a mashing and sparging process, converting the starches to fermentable sugars. The variations can be mind boggling and quite complex. I stayed simple and lots of craft breweries use a single infusion process for their beers. I used 8 lbs. of pale two row malt, 1 lbs. of Naked Golden Oats and a pound of local honey. 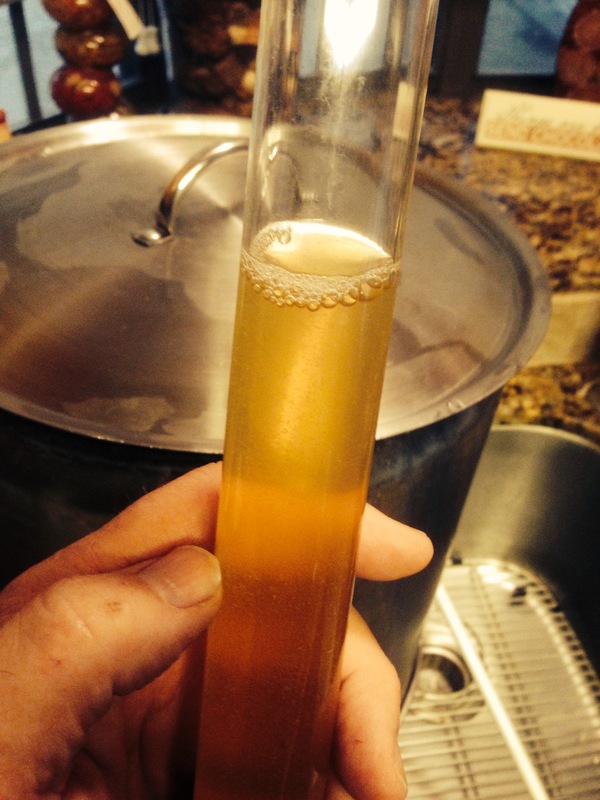 The beer, it will be called “Naked Honey Blonde Ale”…… just to be a little racy. I have almost exactly 5 gallons fermenting as I write. Cascade hops for both bittering and aroma. I plugged everything into a great software program for brewers….BeerSmith. It is almost idiot proof. Based on the ingredients you plug in BeerSmith , it makes all of the calculations. Just a side note….the program calculated an original gravity of 1.046 and I came in at 1.041. Way cool! It estimated the SRM color as 3.2 – Check out the photo below….very Blonde!!!! It added about an extra two hours to my brew day but I think it will be very worth it! Just have to wait about 6 weeks from today…. PS: I plan on mopping the kitchen floor tomorrow! 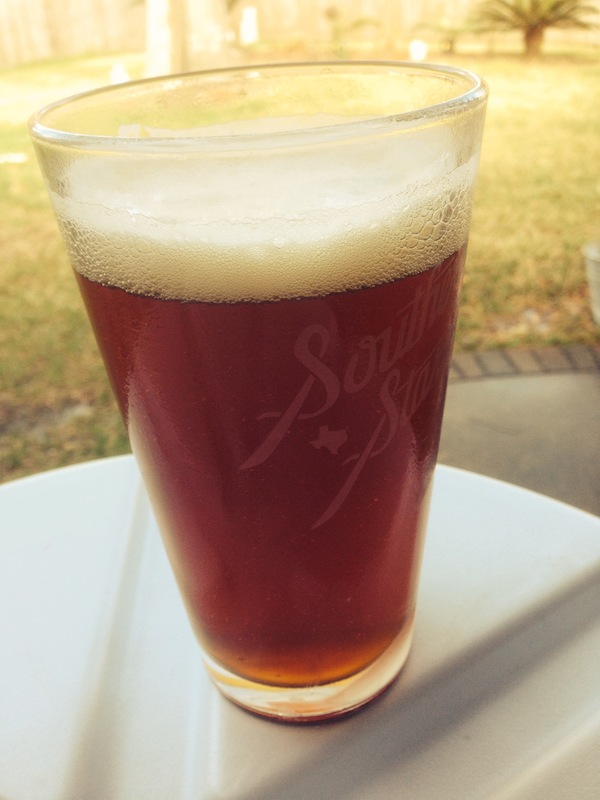 My Golden Wheat Red IPA to help with the lengthy brewing process. Looks like SRM 3.2 to me…Naked Honey Blonde!